Abstract: Off the shelf, the Asus P5B Deluxe/WiFi-AP comes with 8-channel High definition 'Azalia' audio, dual Gigabit LAN, and a wireless 802.11b/g network card. 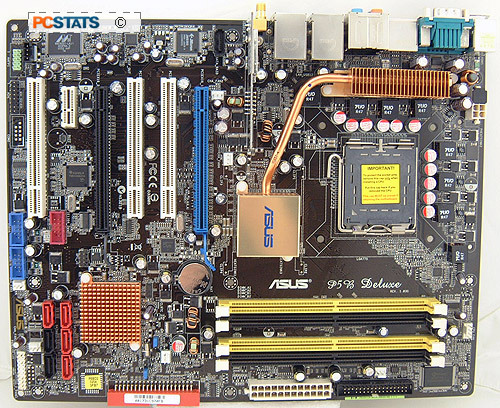 Asus has put together a pretty well rounded package with the P5B Deluxe/WiFi-AP motherboard. Based on the Intel P965 Express and ICH8R chipsets, this board supports all Socket 775 Intel CPUs from the Celeron D to the Pentium 4/D/XE, and of course the powerful Core 2 Duo. 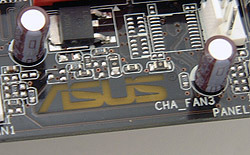 The P965 Express chipset operates with a 533/800/1066MHz Front Side Bus (FSB). The core logic includes a 3GB/s SATA II RAID (0, 1, 5, 0+1) subsystem, so you can hook up four SATA hard drives like the Western Digital WD740 Raptor together for data redundancy in RAID 1 mode, or the pure speed of RAID 0. One port is devoted to eSATA devices, which can be connected at the rear I/O plate. A JMicron 'JMB363' controller brings one IDE channel and an extra SATA channel into the fold on top of all of this, so storage options are very comprehensive. On board memory is skewed for dual channel pairs of DDR-II RAM of course, and as much as 8GB of PC2-800/667/533 memory can be installed into the P5B Deluxe/WiFi-AP. PCSTATS will be using 2GB of speedy Corsair Twin2X2048-6400C4 in the Asus P5B Deluxe/WiFi-AP test system today, and with Microsoft Windows Vista you should never settle for less 1GB RAM. Off the shelf, the Asus P5B Deluxe/WiFi-AP comes with 8-channel High Definition 'Azalia' audio, dual Gigabit LAN, a wireless 802.11b/g network card, Firewire, optical SP/DIF audio output, and plenty of Serial ATA II hard drive support. A closer examination reveals seven internal SATAII channels, one external (eSATA) jack for external data storage devices, eight 480Mbps USB2.0 ports (four at rear & four headers) and two Firewire ports (one at the rear, one header). There is no parallel printer port, and just one serial port on this motherboard. User's Manual, Driver CD, 2x IDE Cable, Floppy Cable, 2x Serial ATA Cables, 2x Molex to Serial ATA Power Cable, I/O Shield. There is a good level of device integration built into the Asus P5B Deluxe/WiFi-AP already, so the two PCI Express x16 slots (one operates at PCI Express x16, one at PCI Express x4) for dual videocards, one PCI Express x1 and three 32-bit PCI slots for legacy hardware ensure the P5B Deluxe/WiFi-AP can handle just about any requirement you have in mind. The Asus P5B Deluxe/WiFi-AP retails for $236 CDN ($200 US, £102 GBP) through most major online retailers like NCIX.com (CDN), Dabs.com (UK) and Newegg.com (US). The Asus P5B Deluxe/WiFi-AP motherboard has a footprint of 30.5 x 24.4 cm, so it's installed into full sized ATX cases with a lot of open space. The layout of components is user friendly, and it's easy to access jacks like the Serial ATA ports and USB/IEEE 1394 headers. The nice thing about high end Asus motherboards are that they come with all the cables necessary to take advantage of the onboard devices. The P5B Deluxe/WiFi-AP comes with USB 2.0 and IEEE 1394 expansion brackets, and a ton of Serial ATA data and power cables. Wireless networking has really taken off and it's great to see a USB2.0 based 802.11b/g wireless network adapter com standard with the board. Based on the Realtek RTL8186L controller, the wireless network card can also act as an access point. This allows you to setup and maintain a wireless network in your home or office without the hassle of using an external router. The only downside being once the computer is shut down, so is the wireless LAN. The Realtek RTL8186L supports both 11Mbps and 54Mbps transmission speeds along with 64 and 128 bit WEP and WPA encryption. An external dipole antenna screws into the WLAN jack, and mounts to the side of the case as far as 40cm away. The antenna has a magnetic base so it will stick to anything steel. The Realtek RTL8186L wireless network card supports WEP 64/128 bit encryption, WPA. Range of 802.11b (11Mb) signals is 40m indoors or 310m with a clear line of sight. Range with 802.11g (54Mb) indoors is up to 30m and 60m again with a clear line of sight. In Access Point mode, the Realtek wireless network card can support up to 64 stations. Setting up a wireless network is very simple, simply install the driver and double click the Windows Wireless utility that will pop up in the task bar. That will allow your computer to scan for all wireless networks within range, simply select yours and enter your WEP/WPA passkey. Most third party wireless networking utilities are simply shells over the default Windows application, so save yourself some disk space and memory by using what Microsoft supplies for WLAN control and eschew the proprietory software where ever possible. ATX 1.4 spec power supplies (given away by a 20-pin main ATX power connector) are compatible with the Asus P5B Deluxe/WiFi-AP motherboard, so long as there is at least 30A+ capacity on the 12V line. Otherwise, it's best to use an ATX 2.0 spec power supply (noted by the 24-pins of its main ATX connector) power supply, like the modular cable Seasonic M12 700W, or PC Power & Cooling's monster Turbo-Cool 510W Express/SLI. Either of these recommendations has the ESP12V connector. Most high end motherboards call for the EPS12V connector to deliver a stable and sufficient supply of power to the CPU, and realistically sooner or later legacy support for just a 4-pin auxiliary power connector is going to get dropped. 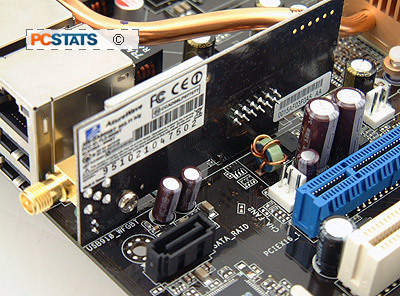 PCSTATS has reviewed some very efficient power supplies here, if you need more suggestions. Next up, a silent chipset cooling solution and the benefits of eSATA. Pg 11. Great Office and Gaming Systemboard?